Home / Archive by category "Law Teaching"
A colleague recently posted a question on the Legal Writing Institute’s mailing list, seeking ideas for “fun” ways to teach students about standards of appellate review. Several other colleagues responded with suggestions, some of them noting the similarity between legal standards of review and the standard for overturning a official’s call in a football game or other sporting event. The point has also been the subject of considerable legal scholarship. I use an exercise in my first-year legal writing classes based upon this similarity. After introducing the concept of standards of appellate review, I show my students a brief clip of a football play involving a close call, and ask students to articulate the relevant rule —for example, a forward pass is illegal after the ball has crossed the line of scrimmage. I tell students to apply that rule to the facts they have observed and vote on the appropriate call. Next, I show the actual call that was made by the field official. Some students will undoubtedly disagree with that call and suggest that it ought to have been challenged. Sometimes a student will even reference the standard that governs instant replay reviews—“clear and obvious visual evidence” warranting reversal (or as it was termed prior to 2016, “indisputable visual evidence”). We then watch the play in slow motion and discuss whether the call should have been reversed under that standard. This leads into a discussion of why the NFL has selected that standard of review, whether it is the appropriate standard, and how it compares to the standards of review used by appellate courts. Down by five points with eight seconds remaining, Seahawks quarterback Russell Wilson threw a long pass to receiver Golden Tate in the end zone. Both Tate and Packers safety M.D. Jennings got their hands on the ball. The two replacement officials near the play made contradictory calls and then ruled that the two players had simultaneous possession, resulting in a game-winning touchdown for Seattle. On review, the referee ruled that there was not adequate evidence to overturn the call, so the touchdown stood. (The scope of review was limited by NFL rules; the field officials probably should have called offensive pass interference and voided the touchdown on that basis.) Two days later, the NFL settled with the referees association, ending the lockout. There are, of course, many other examples that will work. For example, the Dallas Cowboys lost a 2015 playoff game as a result of a reversed call. A collateral attack on that ruling (brought by a prisoner suing the NFL) was dismissed on procedural grounds. Some may prefer to use examples from other sports. Most use a standard of review similar to that of the NFL. 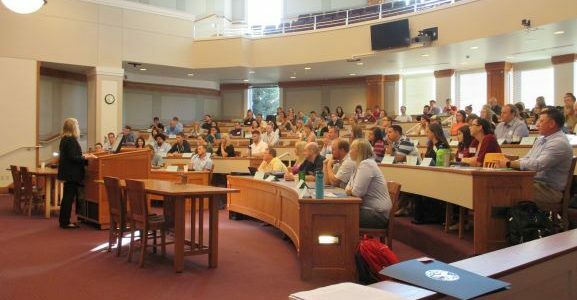 The exercise gives students an opportunity to practice legal analysis in a familiar (or at least different) context, and is especially helpful in introducing them to what otherwise can be a very dry topic. I hesitate to use sports analogies in class, knowing that they are likely to put off some students. But I have found that, at least in this instance, doing so tends to engage students and elicit enthusiastic participation from those who do not usually volunteer (especially Packers fans, even in Bears country). See, e.g., Steve P. Calandrillo & Joseph Davison, Standards of Review in Law and Sports: How Instant Replay’s Asymmetric Burdens Subvert Accuracy and Justice, 8 Harv. J. Sports & Ent. L. 1 (2017), http://harvardjsel.com/wp-content/uploads/2017/01/Calandrillo.pdf; Kenneth Kilbert, Instant Replay and Interlocutory Appeals, 69 Baylor L. Rev. 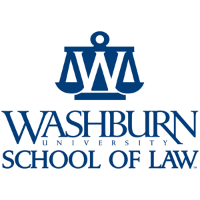 267 (2017), https://ssrn.com/abstract=3008827; Russ VerSteeg & Kimberley Maruncic, Instant Replay: A Contemporary Legal Analysis, 4 Miss. Sports L. Rev. 153 (2015), http://mssportslaw.olemiss.edu/files/2015/09/EIC-VerSteeg-Edit-FINAL-Macro-p.-153-273.pdf; Mitchell N. Berman, Replay, 99 Cal. L. Rev. 1683 (2011), https://doi.org/10.15779/Z38DQ4S; Chad M. Oldfather & Matthew M. Fernholz, Comparative Procedure on a Sunday Afternoon: Instant Replay in the NFL as a Process of Appellate Review, 43 Ind. L. Rev. 45 (2009), https://mckinneylaw.iu.edu/ilr/pdf/vol43p45.pdf; Aaron R. Baker, Replaying Appellate Standards of Review: The NFL’s “Indisputable Visual Evidence”: A Deferential Standard of Review, 16 Tex. Ent. & Sports L.J. 14 (2007), http://teslaw.org/wp-content/uploads/bsk-pdf-manager/2017/03/Spring_2007_vol.-16-1.pdf; S. Christopher Szczerban, Tackling Instant Replay: A Proposal to Protect the Competitive Judgments of Sports Officials, 6 Va. Sports & Ent. L.J. 277 (2007), http://heinonline.org/HOL/LandingPage?handle=hein.journals/virspelj6&div=15; Bennett Liebman, Reversing the Refs: An Argument for Limited Review in Horse Racing, 6 Tex. Rev. Ent. & Sports L. 23 (2005), http://heinonline.org/HOL/LandingPage?handle=hein.journals/tresl6&div=4; Jack Achiezer Guggenheim, Blowing the Whistle on the NFL’s New Instant Replay Rule: Indisputable Visual Evidence and a Recommended “Appellate” Model, 24 Vt. L. Rev. 567 (2000), http://heinonline.org/HOL/LandingPage?handle=hein.journals/vlr24&div=22. The issue in this case is whether Supermarket Corp. was responsible for maintaining the premises in reasonably safe condition. A basic tenet of premises liability in tort law is those who own or control property have a duty to maintain it in safe condition. Oliveri v. Massachusetts Bay Transp. Authority, 363 Mass. 165, 167 (1973). Supermarket Corp. was the owner of the property where the accident occurred, and was also in control of the store on the premises. Therefore Supermarket Corp. was responsible for maintaining the premises in reasonably safe condition. The problem with IRAC is most legal reasoning is not that simple. Society doesn’t need lawyers to analyze legal problems that can be deduced from a general rule. The problems lawyers are most often tasked with analyzing involve analogical reasoning. We analogize or distinguish fact patterns to determine whether and how the rule applies. So the “A” in IRAC isn’t usually as simple as applying the rule to the facts. We need to compare the facts of the fact pattern to the facts of a similar case. And IRAC doesn’t give the students much guidance on how to structure the application portion of the analysis. When I teach IRAC as a form for analyzing a legal issue, I tell students to start with the issue and the rule, then apply the rule by giving an example of how the rule was applied in a reported case. To do the application part of IRAC, start with the facts of the case, describe the holding, and explain the reasoning for the court’s decision. Then state the fact pattern is analogous, compare the facts to highlight the similarities, apply the rule of the case, and come to a conclusion. The mnemonic I use to help students remember that structure is “Ferrari Has Really Fast Race Cars,” which stands for Facts, Holding, Reasoning, Facts, Rule and Conclusion. The issue in this case is whether evidence of dirty brown wax beans and black strawberries on the floor of a supermarket is enough to show the property owner breached the owner’s duty to keep the premises in reasonably safe condition. “Where a foreign substance on a floor or stairway causes the business visitor to fall and sustain injuries, he may prove the negligence of the defendant by proof that . . . the foreign substance was present on the defendant’s premises for such a length of time that the defendant should have known about it.” Oliveri v. Massachusetts Bay Transp. Authority, 363 Mass. 165, 167 (1973). For example, in Anjou v. Boston Elevated Ry. Co., 208 Mass. 273 (1911) the plaintiff slipped and fell on a banana peel. According to witness who had examined it, the banana peel “’felt dry, gritty, as if there were dirt upon it,’ as if ‘trampled over a good deal,’ as ‘flattened down, and black in color,’ ‘every bit of it was black, there wasn’t a particle of yellow,’ and as ‘black, flattened out and gritty.’” Id. Based on that evidence, the court held that “[t]he inference might have been drawn from the appearance and condition of the banana peel that it had been upon the platform a considerable period of time, in such position that it would have been seen and removed by the employees of the defendant if they had been reasonably careful in performing their duty.” Id. A banana peel is perishable. It decays over time and turns black. Therefore, if a banana peel looks black and gritty, it is reasonable to infer it’s been sitting for a while. This case is analogous. The customers in both cases slipped and fell on perishable substances. Wax beans and strawberries, like bananas, are perishable. After the passage of time, beans turn brown and strawberries turn black, just like bananas turn black when they decay. For the same reason it is reasonable to infer a black banana peel has been on the floor for a substantial length of time, it is also reasonable to infer dirty brown beans and black strawberries have been on the floor for a long time. Based on the evidence, the store owner in this case should have known of unsafe condition and either cleaned it up or warned customers of its existence. By failing to do either, the owner breached the duty of reasonable care. Evidence of dirty brown wax beans and black strawberries on the floor of a supermarket is enough to show the property owner breached the owner’s duty to keep the premises in reasonably safe condition. Ferrari Has Really Fast Race Cars. To apply a rule by making an analogy, start with the Facts of an analogous case, and the case citation. Then state what the court Held, and explain the court’s Reasoning. Insert a paragraph break and state the fact pattern is analogous. Then compare the Facts of the fact pattern to the facts of the case. Apply the Rule to the fact pattern the same way the court applied it in the case. And come to a Conclusion. In the spring semester of 2017—sitting in a fluorescently lit, sterile classroom—I watched a pair of my students awkwardly negotiate in the front of the classroom with my colleague who was playing the role of an Afghan police chief. 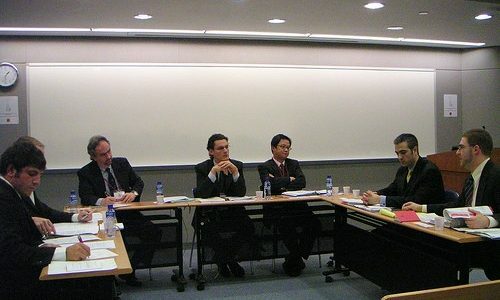 The simulation was a roleplay assessment offered as part of the United States Air Force Academy’s negotiation course. The students were playing the role of two junior Air Force second lieutenants who needed to negotiate security protocol with the police chief in his Afghanistan-based office. The students mechanically applied a few of the negotiation skills I taught them during the course. One of the students smirked at something my colleague said while in character, seemingly scoffing at the ridiculousness of the simulation. This irritated me. I wanted the students to take the simulation seriously and chalked up their lack of enthusiasm as their problem, not mine as the professor. Shortly after, I realized it was my problem. After the simulation, but before fall 2017 semester started, I participated in an “escape the room” game. The premise of escape the room game is to solve a series of riddles and puzzles using clues embedded in a thematic setting. Although the building which housed the game was in a nondescript industrial park, my particular game was set in a mountain hunter’s cabin, complete with trophy mounts, wood paneling, a worn bookcase, pad-locked drawers inset within a desk, and a trap-door-backed fireplace. As I crossed the threshold from the office waiting room into the “game room,” I was transported. Dozens of details in the room were clues that lent to a piece of a bigger puzzle. For example, by reading backwards a riddle inside a tattered book on the inconspicuous bookshelf in the corner of the room, I realized I needed to count the number of “points” on the trophy mounts hanging on the wall, which then provided the numerical combination necessary to open a pad-locked drawer of a desk in the room. The contents of the drawer provided another clue for the next puzzle. For sixty minutes I felt as though I was truly locked in a hunter’s cabin, largely due to the thoughtful details which made the game authentic. 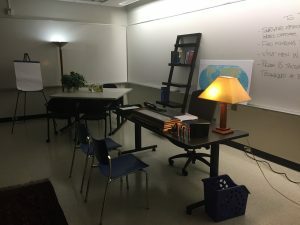 Before conducting the Afghan simulation again the following semester, I decided to transform my classroom into the Afghan police chief’s office, using the inspiration from my experience in the escape the room. First, I placed two free-standing floor lamps in the room to provide low, warm lighting to replace the fluorescent lamps that previously shined overhead. I moved a light-weight bookshelf next to a freestanding, dark-stained table which served as a desk. I stocked both with a few books and mementos typical of a real office. A framed picture of my family sat on the desk next to a collection of dry erase markers which the best students would ultimately use to brainstorm potential options on the flipchart resting on an easel just feet away from where they sat. A framed, ornate dagger was placed on the edge of the desk for intrigue and intimidation purposes. A side table, set with a water pitcher and four matching glasses, sat inconspicuously next to the desk. Behind the desk, a “to-do” list was written on the large whiteboard, serving as clues to the interests of the police chief, about which the wisest of student would inquire. There were dozens of planted details and clues that students could have used to help unlock success in the simulation. Remarkably, very few students used the clues that were within fingers’ reach of where they sat. The students who performed the best identified the planted clues and used them effectively. For example, students who noticed the framed picture on the desk and asked whether the Afghan police chief was a father or husband, created a terrific opportunity for rapport building. Even better, those students who asked about to the “to-do” list written on the whiteboard behind the desk unlocked a number of interests of the police chief that were not otherwise apparent. One of the best pairs of students asked the Afghan police chief to sit at the side table where they all would be more comfortable, eliminating the power dynamic by removing the police chief from behind his desk. In a debrief following the exercise, students noted just how unique the experience was. Many reported feeling nervous and unsure of themselves when they walked into what they described as “the dim lair of the Afghan police chief.” Some claimed to have recognized the planted details, but many admitted they did not know what to do with them. Some recounted the adrenaline they felt walking into the room, as if they were stepping onto the sports field ready to compete. Others described crumbling under the weight of nervousness and uncertainty. All agreed the experience was unique and realistic. A few students offered ways to even further improve on the experience. For example, one student suggested playing authentic Afghani music at the beginning of the exercise while students walk into the office to begin the simulation. Another student offered the idea of lighting incense in the room to add to the authentic experience. 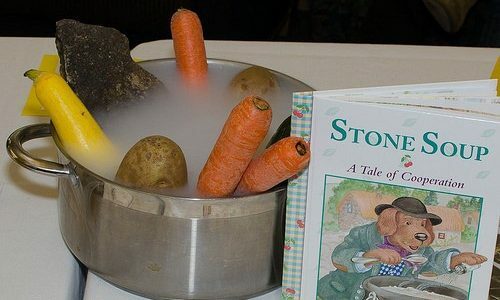 Ultimately, I offer this advice to educators concerned with the lack of enthusiasm in roleplay scenarios: if you want your students to submerse themselves into your simulation, make it irresistibly authentic. Not only will it improve the level of engagement, but it will provide a unique opportunity students may not experience until they graduate. The views expressed herein are those of the author and do not necessarily reflect the official policy or position of the United States Air Force Academy, the U.S. Air Force, the Department of Defense or the U.S. Government. Your law class has 60 students. Within 2 weeks of class you realize that some are weaker than others as you get a sense of the responses to class questions and the responses of small formative assessments. 20 minutes into one class some students understand the black letter concepts quickly and are ready to move on to more nuanced and sophisticated examinations of the doctrine. Others have trouble grasping simpler even elemental concepts. What is the appropriate teaching decision at this point? Should you revisit the doctrine to try to get every student on board or should you teach to keep adding complexity and information to avoid boring some students with repetition of concepts these students already understand? This continues to be a challenge to many professors and I guess in a very unscientific manner my solution was to consider myself having done it right if on my student evaluations “a few” students said that I went too quickly. That way I felt only a few complained and the pace was therefore not too slow for the majority/middle. More recently I have taken to doing the traditional teaching at a pace that suits the students who are getting the material the fastest. This takes about 1/2 the classroom time that I would need if I was doing the same presentation for the majority/middle. At this point some students look at me and are woozy from information overload. At this point in the lecture I divide the class into groups of 3-5 students. These groups are different each time and are randomly created and consist of students all along the spectrum of doctrinal understanding. I then handout a series of short problems based on the material we just covered way too quickly for most students to feel comfortable. The first problem is very basic but each becomes slightly more complicated. Each group assembles in a particular region of the classroom and each group is required to do each problem. For example after teaching the basics of assault and battery in torts I distribute the following problem set to the groups. I ask each group to type up the perfect answer to each problem. After each problem in italics are the substantive concepts I hope the particular problem invokes. After about 15 minutes of group work we begin to discuss the hypotheticals. As a group the students respond to the questions and one student from each group reads the typed up group answer. When they are done I ask if any groups disagree and why with the explaining group’s conclusions and reasoning. I do this for each question and I simply moderate the discussion without leading it. Active learning, students are engaged in learning activities that they do at their own pace and they develop their own contexts for understanding the doctrine not those of the perceived “uncool, geriatric lecturer” in the room. Basically this active portion of the class renders the “to whom do I teach,” question irrelevant because the students who got it are learning it even more thoroughly by having to explain it and the students who did not get it when I taught it have the opportunity of another method of delivery of the concepts. The hardest part about this for us ego driven professors is realizing that after my initial teaching of the concept those students who don’t understand it from me may never understand it from me so why get in the way of their learning and waste class time by stagnating the learning and braying about the doctrine repeatedly. When teaching a new and complicated concept, it is always a good idea to help our students make connections to what they know. When teaching the idea of using the facts of the precedent cases to compare to the “client” facts in order to come up with a prediction of the outcome of the case, I use simple props and a simple exercise designed to connect this new concept to concepts they have mastered already. To achieve the desired result, which is learning how to compare facts of cases to facts of the “client” and utilizing reasoning, I use different sized paperclips and a binder clip. What is the concept for today’s course? What will be important ideas in today’s concept? What do you already know about this concept? To what can you relate this? What will you do to remember the key ideas regarding this concept? Is there anything about this concept you don’t understand or are not clear about? I separate my students into groups of three and give them each a large metal paperclip, a small metal paperclip, a plastic paperclip, and a binder clip. Then I ask the groups to look at the two metal paperclips and compare them, factually. Students come up with similarities: shape, material, and color. I ask them, “how are the different?” The students know that size is the difference. The next question for them is “does that difference change matter?” Students instinctively know that it does not. When asked why, they can articulate that the purpose of the paperclip is to hold paper, and, thus, unless it is a huge stack of papers, the size does not really matter. At this point, it is easy to say, “yes, if you know the purpose of the paperclip is to hold paper, then you can decide what differences and similarities are important.” Next, I typically pause and let that sink in for the students. After the pause, I tell them, “if the paperclip is a ‘rule’ and you know the reasoning behind the rule, you can more easily decide if the factual difference will be important to the court.” Once that point is made, it is easy then to bring in the binder clip. The binder clip is much different factually from the paperclip; but could the “paperclip rule” cover the binder clip? I have the students debate this for a couple of minutes and report back to me. It is a fairly cheap and impactful exercise which engages the students, connects a difficult concept to something they already know and helps facilitate learning. 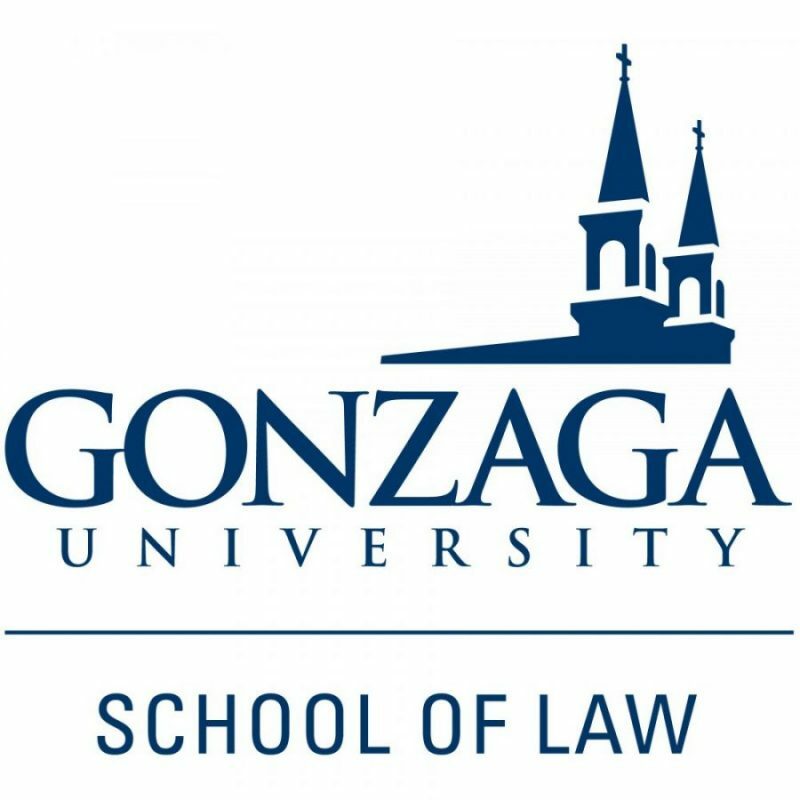 Submitted by Sandra Simpson, Associate Professor of Legal Research and Writing at Gonzaga University School of Law and the Co-Director for the Institute for Law Teaching and Learning.